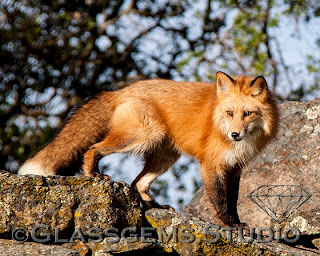 I am thrilled to say that my photographs have been accepted in the Central Sierra Environmental Resource Center, annual photography contest. 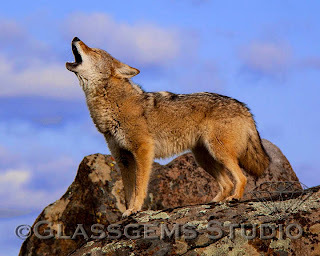 My Coyote, titled "The Calling", received third place and my cougar and fox made it in the finales. I entered four but only three made the finals. 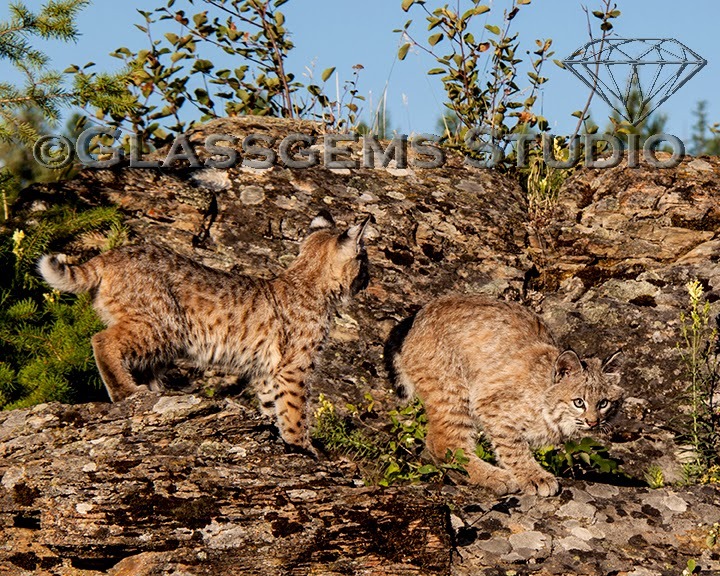 This fox and the cougar made the finals and the following photo of the bobcat kittens did not make the finals. Photography is another one of my passions so I thought I would share them with you. For those of you who are interested in seeing the rest of the contest, click here. For those who are wondering I'm still working on the book, I'll keep you all posted with the progress. 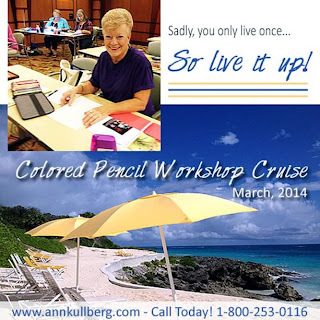 The Colored Pencil Cruise is Filling up Quickly!!! This Colored Pencil Cruise is filling up quickly, if you were thinking about joining us there are only 5 spots left!! Come join us these cruises are always a blast! Workshops conducted on the three "At Sea" days. No workshops held during port days. Class size firmly limited to 24. Non-workshop participants are more than welcome. Bring a spouse, a friend...your mom! 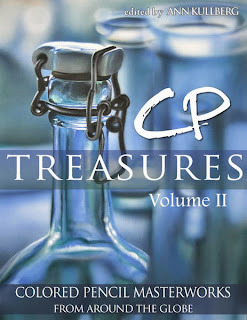 I am excited to announce that my artwork has been accepted to be published in Ann Kullberg's CP Treasures, Volume II book. I am very honored to be selected because there was over 600 entries and I believe only about 75 were selected out of that 600. I'm not sure exactly when the book will be available but from what I understand it will be available for the Holidays. I'll keep you posted as to when the book can be purchased. For those of you who are wondering about the progress of my own book, I'm still working on it. I had to put it on hold for a while because of a family illness but I am happy to say that I am now back to work on the book. 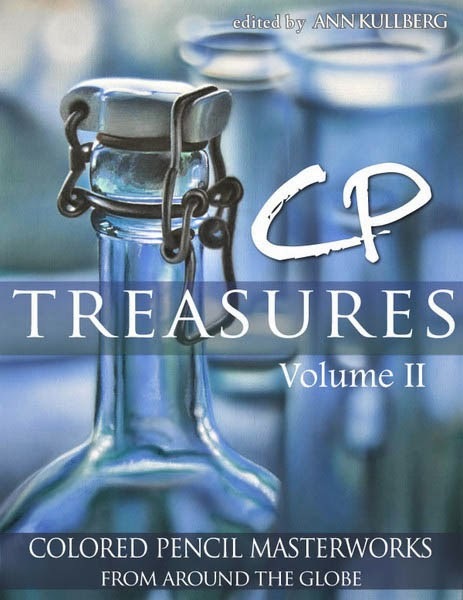 I have gotten 3 3/4 chapters done out of 8 so hopefully the book will be done next year before the holidays. 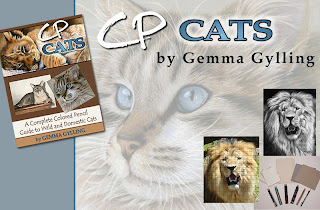 Thank you to all of you who have sent me pictures to use in the book! I am thrilled to hear that my bobcat kittens, titled, Double Trouble, have been selected for a Special Merit Award for the Animals Art Exhibition at the Light Space & Time Gallery. 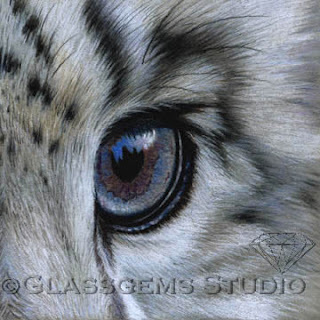 This piece was done with 100% colored pencils on suede mat board. As I'm sure some of you already know, my daughter has been very ill, she contracted the flesh eating bacteria. She was in ICU for over a week, had three surgeries, but is now doing better. She is currently in a rehab hospital that specializes in that kind of wound care and will be there for at least another couple of months, maybe more. The last couple of months have been very scary for our family. While I was visiting her in the hospital all day long I thought I would try to do some scratch board art. It is something I have always wanted to try. What is so nice about scratch board is while I was sitting there for hours all I needed was the scratching tool and the scratch board. No don't worry..... I am still going to do first love, Colored Pencil, and I am continuing on my book but the scratch board was so therapeutic while I was sitting there for hours. I did put my book on hold for a few months because of what we were going through but I will be starting back up on it in the next week or two. This piece is titled "A Quiet Respect" done by scratching away the black ink to expose the white clay board under the ink. I also did a little bit of colorizing with a few colored inks. I came up with this title because I couldn't believe how much pain my daughter was going through and how well she is handling this horrible situation, she has needed lots of strength to go through this. I was thrilled to see that the City of Brea Art Gallery chose my artwork, "Animal Totem; Cougar and the Cloud Spirits" to use in the promotional material for the Colored Pencil Society of America's Exhibition. Woo Hoo!! You are invited to attend the 21st Annual Colored Pencil Society of America’s International Juried Exhibition, at the City of Brea Art Gallery. My artwork is one of the 120 pieces of artwork that was selected to be exhibited in the show. The Artist’s Reception for this exhibit, will take place on Saturday, August 3rd from 7-9 PM. There will be light refreshments at the reception. I will be there, along with many well know Colored Pencil Artists. 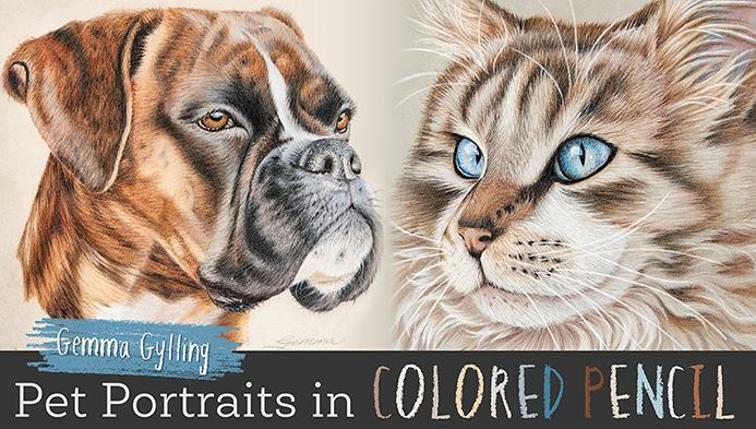 You will be amazed at what can be created with colored pencils. Please stop by and say hi! 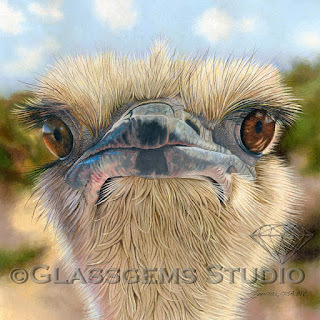 I just got notification that my artwork titled, "Here's Lookin' At Ya!" has been accepted in the Artists for Conservation art exhibit. When judging the art they accepted 197 pieces to be displayed online in the virtual gallery and among those selected for the virtual gallery, 80 were selected for the live exhibit at the Art Festival in Grouse Mountain, North Vancouver, BC. My piece was one of the 80 selected for the live exhibit, so it will be displayed in the live and the virtual exhibit. I am so excited and honored!! Hey everyone.... I desperately need your help!! As many of you may know, I am in the process of creating a book. 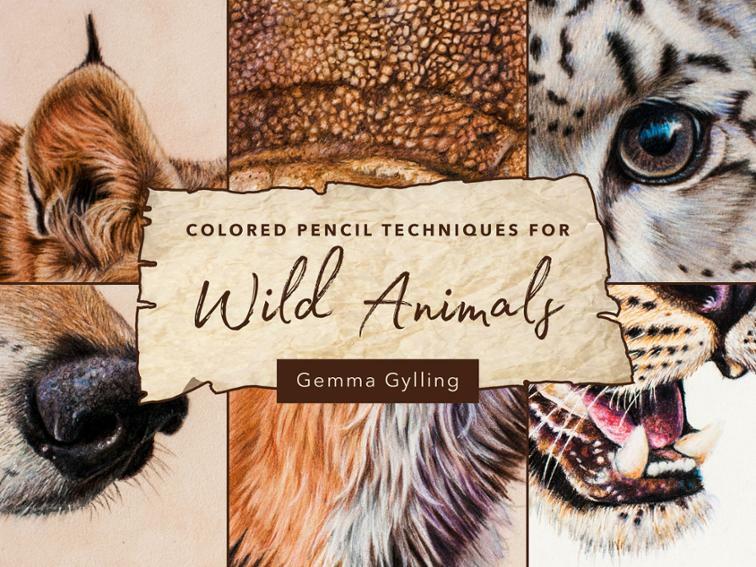 The book is on how to draw cats (both wild and domestic) with colored pencils. I have lots and lots of pictures of wild cats but I don't have very many pictures of domestic cats. 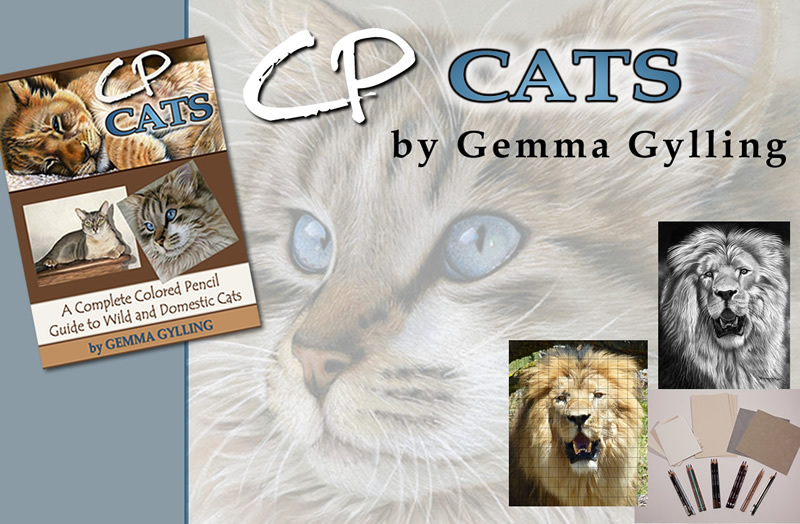 If you have cats and want them to be drawn by me and in my book, please send me pictures. I need high a resolution photo, 240-300 DPI and minimum of 1800 pixels. 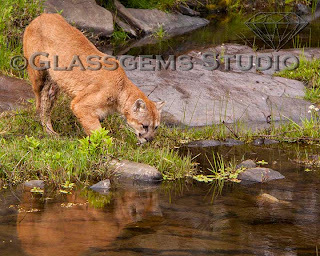 If you plan on taking new photos for this occasion be sure to set your digital camera on large images, those should be plenty big enough for me. The photos have to be clear and not blurry. If you have some pictures you would like to share send me a message at this link: Contact Gemma and I will give you an email address of where they can be sent. I really appreciate any help I can get!! 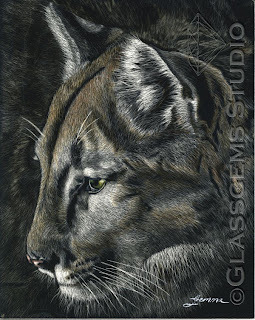 The Mountain Lion I showed you in my last post was actually part of a larger piece called "Animal Totem". I'm not so sure I'm happy with this but I guess we as artists often times come across that issue. This is a piece I have been wanting to do for quite some time so I thought I would hit two birds with one stone. 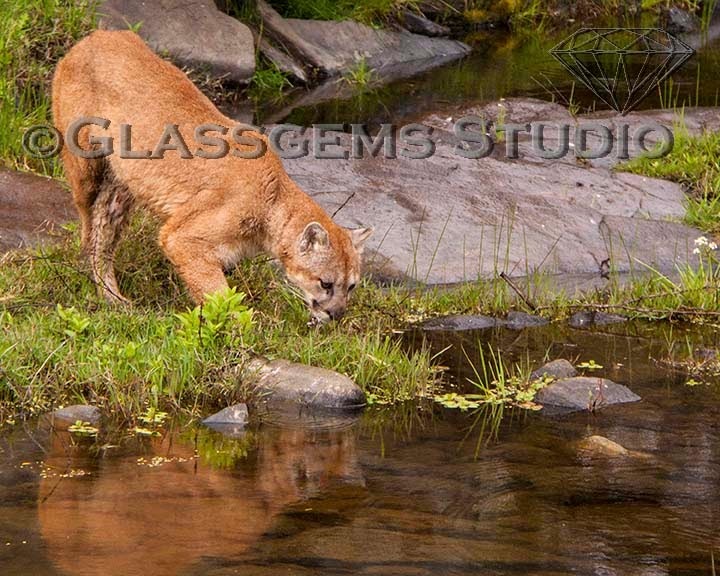 I needed to create the workshop materials for the wildlife workshop I will be teaching in August of this year ,so I am using the mountain lion part of this for that workshop. I continued on with it to create my vision I had with the Native American hidden in the clouds. I have always been fascinated with the animal totems and the spiritual meaning of the animals, in ancient myths and stories, so I thought I would try to portray that feeling in this piece. I'm not quite sure if I was able to capture that but hopefully this piece will move someone. In those ancient myths the cougar symbolizes "Coming into Your Own Power". 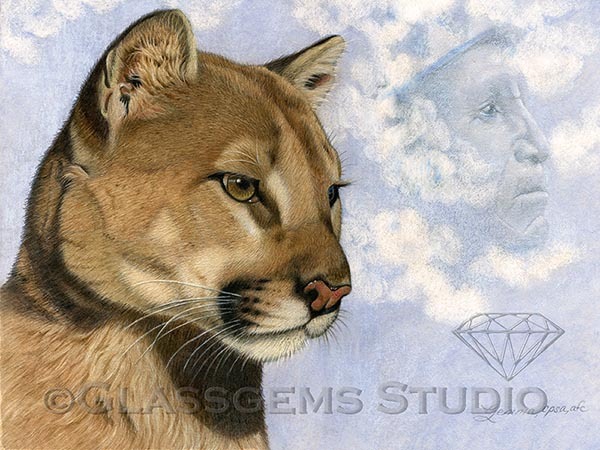 I personally have always loved the Mountain lion/Cougar, it is one of my favorite animals. 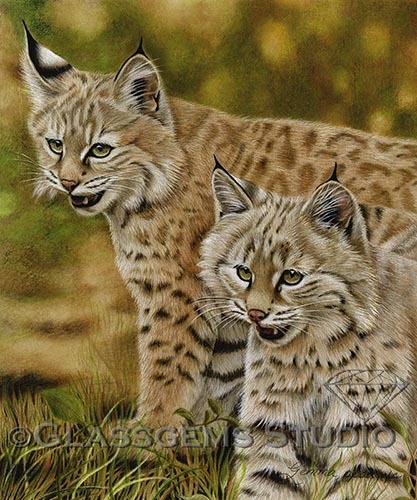 This piece is piece is 100% colored pencil, done on light tan suede mat board and the size is 12" x 16". If you have any questions or comments just let me know. I just finished the drawing for my new workshop I will be offering. 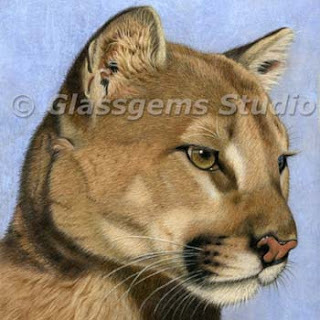 The workshop will include a workbook with complete instructions on how to complete this portrait of a mountain lion. The finished piece is 8" x 8", on light tan suede mat board and 100% colored pencils. If you have any questions don't hesitate to ask and don't forget to "Keep Scribbling".